*Disclaimer: I am not a doctor. Information contained in this post are for informational purposes only and not intended to be a substitute for medical advice, treatment, or diagnosis. Please seek advice from your general practitioner or pediatrician for any questions you may have regarding a medical condition. Reliance on the information in this post is taken at your own risk. Affiliate links contained in this post. No matter which side of the vaccine debate you are on, the recent surge in media coverage on the latest measles outbreak can be alarming for any parent. There’s risks on both sides, whether you and your children have received vaccinations for measles or not, you may still be at risk of contracting measles. Despite current media hysteria, in the last three out of four years, there have been more cases of measles than there have been with this current outbreak. The risk has been there. What we want to do here is simply be proactive and let you know what you can do to protect both you and your family during this time. 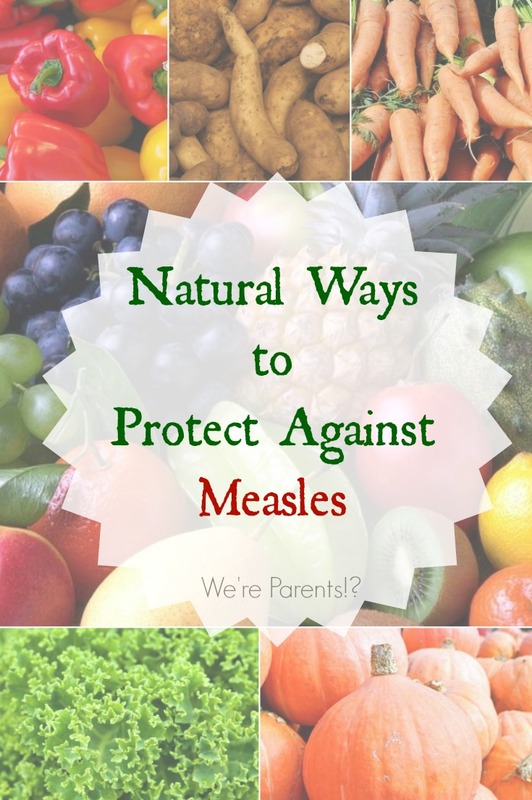 So, what are naturals ways to protect against measles? Measles, according to the CDC, starts with a mild to moderate fever, and then one notices the other symptoms. The rash is made up of small red spots, some of which could be raised, in clusters. Typically, one notices the rash behind the ears and along the hairline, then the face, down the arms and trunk, before moving to legs and feet. What can I do to lessen our risk of measles and/or aid in the treatment of measles? SUNLIGHT – Okay, this isn’t a food, but just 10 minutes of sunlight provides the daily recommended amount of Vitamin D. Stay outside for 30 mins everyday! Adults should be drinking 9-13 cups everyday (men more than women); Children over one should be drinking 4-5 cups everyday. We take similar supplements for ourselves. These are some of the ways that we are working to naturally protect against measles ourselves, in addition to protecting about everyday illnesses that one may experience this time of the year. We truly hope that everyone stays safe and works hard to protect their immune systems the natural way. This post is not meant to be looked at as saying that if you do these things you or your loved ones can’t catch measles, but rather that these things will boost your immune system to naturally protect against measles in the event that you do, they can lessen your overall symptoms.